From the kitchen of One Perfect Bite... The day began with streaks of terra cotta trailing through the sea of aquamarine that is our early morning sky. It heralded a lovely day to come. We took to the rear deck with morning mugs in tow and sat a spell, admiring the few courageous blossoms emerging from the forest duff. Then we heard birds and realized the winter silence of the forest was also at an end. Winters here are mild and of short duration. Most of the folks who've settled here are transplants and they can be slow to adopt the ways of native Oregonians. Once they're fully assimilated, they're said to have "gone native". I think that's finally happened to me. I found myself complaining about the weather this year. Memories of winter blizzards and sub-zero temperatures have been replaced with the quiet discontent that comes with prolonged periods of gray weather. I am, finally, an Oregonian. As such, I was determined to enjoy every moment of this gorgeous day. We decided to grill a chicken. I loved that, because its simplicity gave me an opportunity to try some highly flavored dishes that would be hard to pair with anything more involved. 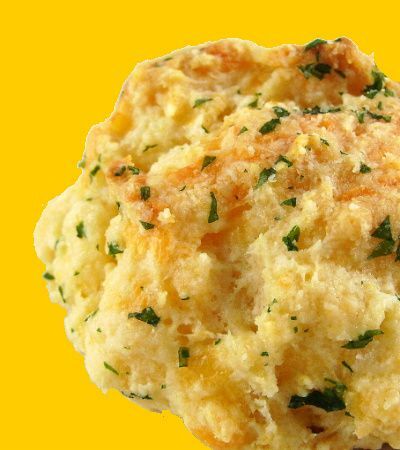 I've never eaten at Red Lobster, but I've been told their biscuits are extraordinary. 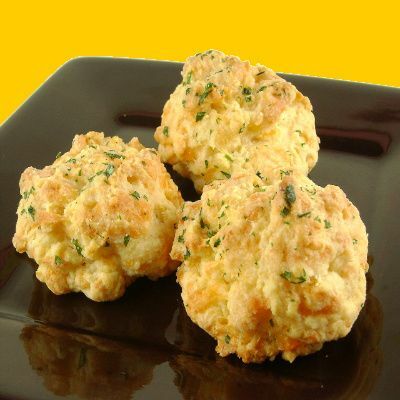 I was able to find two copy-cat type recipes for their cheddar biscuits. One uses a baking mix and the other builds the biscuits from the ground up. I chose the more involved recipe because I had no biscuit mix in the house. The recipe comes from Food and Whine and it makes a nice biscuit. They are easy to do and I found myself charmed by their gnarly down-home appearance. I'm happy to recommend these to you, but do be aware they're not meant to be served with delicate food. Think grilled chicken, steak, ribs or pulled pork and you'll be fine. This is grub at its finest, but it is grub. Here's the recipe. 2) Whisk flour, baking powder, salt and garlic powder in a large bowl to combine. Add chunks of butter. Cut butter into flour until mixture is coarse and resembles peas. Add oil, grated cheddar cheese and 1/2 cup milk. Stir together. Keep adding milk a bit at a time, until the dough is just moistened and holds together. 3) Use an ice cream scoop or large spoon to drop 1/4 cup portions onto cookie sheet. 4) Bake for 15-17 minutes. or until biscuits are a light golden brown. 5) While biscuits are baking, melt 3 tablespoons butter is a small bowl in your microwave. Stir in 1/2 teaspoon garlic powder and the parsley. When biscuits come out of the oven, use a brush to spread garlic butter over tops of biscuits. Serve warm. Yield: 12 biscuits. Grub sounds good to me! I always love wholesome rustic food. It looks more welcoming and warm if you know what I mean. :) n those biscuits have that quality about it...grub at its best. wow... cheddar cheese with garlic butter biscuits.. wish i could taste this..
Mary, I like your scenic descriptions as much as I like your food. I would serve these for breakfast food. Your description make me feel like visiting Oregon :-). Wow those biscuits look perfect. I love the combination of cheddar cheese and garlic. Oh and butter! Yum! I think I will have to try these..my family loves those biscuits..you made me homesick with your descrption of the day. I changed the wet,gray winters of Washington for the cold, frozen tundra of Minnesota (at least until retirement)Have a great weekend ..I love all your pictures, you have great presentation. Mary, you paint such a lovely picture, and had it not been for all those Doug firs, I could have seen you relaxing on your deck! ;) A beautiful day indeed as we made another raised vegetable bed, raked, cleared fallen oak branches..., and did way more than our bodies cautioned against. Drop biscuits and grilled chicken sound delightful! Thank you Mary. My daughter made a mini version of these cheesy biscuits recently. The recipe you used is a little different than ours, so we'll have to do a side-by-side taste test. Life is so hard. Mary, you should write for the Oregonian Travel Bureau ~ for your words are pure artistry about the beauty of your state. I make these all the time, except that I use pancake mix to make it even easier. When I was in college I was a waitress at Red Lobster, and Bisquik was the base for their garlic cheddar biscuits. Our kids love them! Forget the appearance being gnarly, the recipe sounds gnarly! Yum! I love biscuits. Thanks, Martha. I still haven't learned to count :-). I've made the correction. Does that ever look good - all melty, crumbly goodness of bread and cheese. A definite winner. Mary, these look absolutely wonderful! Thanks. Mary, I recently discovered your blog and just wanted to register my appreciation for your delicious writing as well as your nummy recipes. I read you more for the former than the latter because I fear the former is rarer! Thanks, sweetie! I don't care for the taste of Bisquick, so I like that these are made from scratch. They do look good... they'd be great with a bowl of soup! always enjoy my visits with you..ooo.just think. Spring will soon actually be here and I can hardly wait. grub indeed, but what could be better. This is my favorite biscuit! Your photos are so wonderful...Can I ask what type of camera you're using? Is it an SLR or a point and shoot. My old 1st generation Olympus digital is on the way out and I've got to replace it quickly! I've made these before, though I try not to make them too often, because I simply cannot stop eating them once I begin. Nancy Jane I use a Canon Power Shot A590 IS. It's a point and click. i love the touch of the garlic in this recipe. I bet without the garlic they wouldn't be special. With it too tempting! Love the rustic, knobby look on these and yes Saturday was Beautiful! Today...well, it's beautiful in a dreary, cold kind of way!! These biscuits look hearty. I love this kind of drop biscuits. the problem is, I could never just eat 1-2 of them. The idea of taking your mugs of coffee at daybreak to enjoy the scenery is just blissful. Oregon is a beautiful place--the gray days make you appreciate the sunny ones even more. The biscuits look delicious--love the garlic and cheese. I've only eaten at Red Lobster once and I can tell you, the biscuits are the best part of the meal! This is a wonderful recipe. I love the flecks of parsley showing in them. I am such a biscuit lover and I am never able to stop at just one! This is the kind of food I could eat all day long every day! Wonderful recipe, Mary! Thanks so much for sharing! Mary, bring on the grub!! Mary, I went to a friend's house for breakfast and she served cheddar muffins. I wished for the recipe but hesitated to ask for it. And here you have one here, that is just exactly what I was looking for. THANK YOU! Saving!!!! These are perfect for some soup! Love the cheesy flavour of it. These are delicious!!! I've made them quite a few times and everyone always asks for the recipe! I love them!